FY is a 50-year-old Malaysian. His problem started with headache, poor appetite and weight loss. He consulted a doctor in a private Hospital A in his hometown. He was told there could be something in the brain. A CT scan was done and there was a lump in his lung. 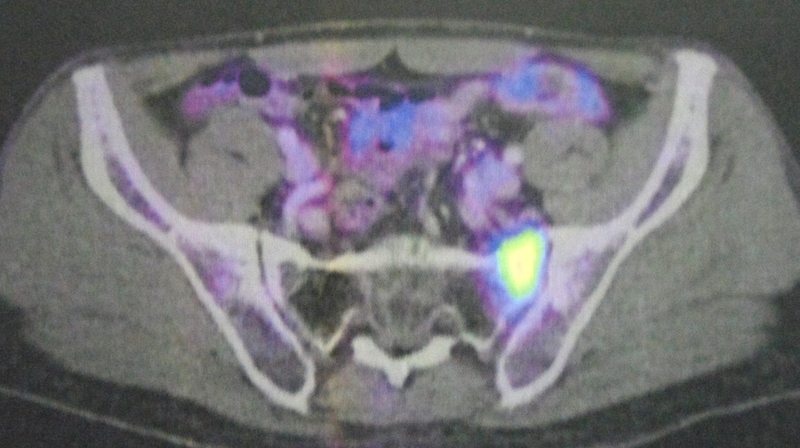 A biopsy confirmed a moderately differentiated adenocarcinoma. FY was referred to a private Hospital B in Penang. The biopsy tissue was sent to Kuala Lumpur for further analysis. EGFR mutation was detected. In the meantime, FY underwent five times of radiation to the head (due to the headache). This treatment cost RM11,000. The oncologist suggested taking oral chemo. FY decided to seek further treatment in another private Hospital C. The oncologist in Hospital C prescribed oral drug, Tarceva. This was the deal. Take Tarceva for ten months, thereafter it will be provided free of charge for life. Each month’s supply cost RM4,500, meaning FY will have to fork out a total of RM45,000 first before he could enjoy the free supply of Tarceva. In all, FY took Tarceva for 11.5 months. So, he managed to enjoy free Tarceva for 1.5 months. 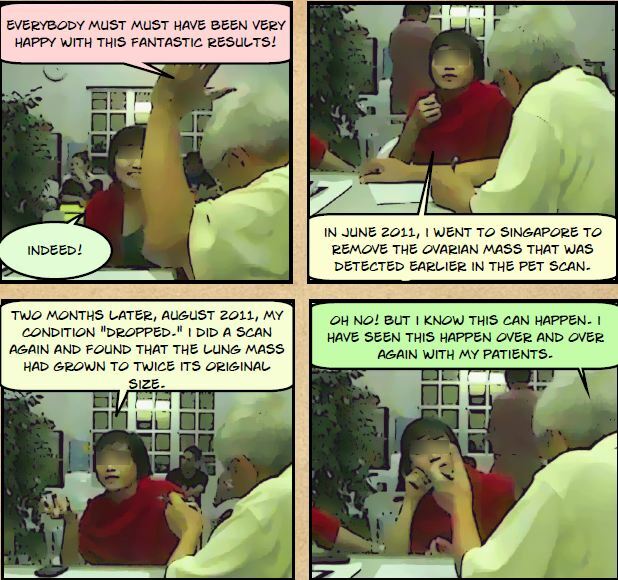 The progress of FY’s treatment was monitored by scanning and blood tests. 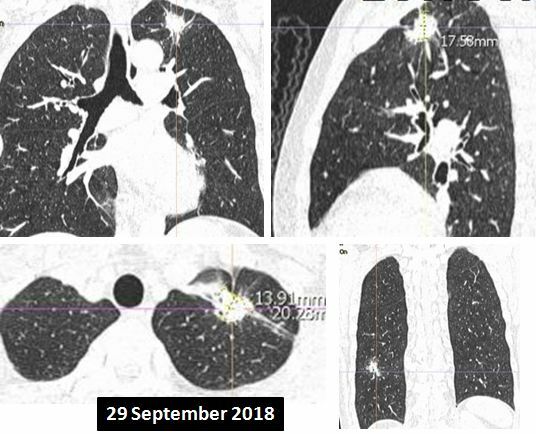 CT scan thorax done in Hospital A, 29 August 2017.
a suspicious 3.4 x 2.8 x 3.3 cm lump in the lower lobe of his left lung. CT scan of brain, neck, thorax, abdomen and pelvis done in Hospital C, 26 September 2017.
lesion at apical segment of left lower lobe of lung and small cavities due to primary carcinoma. 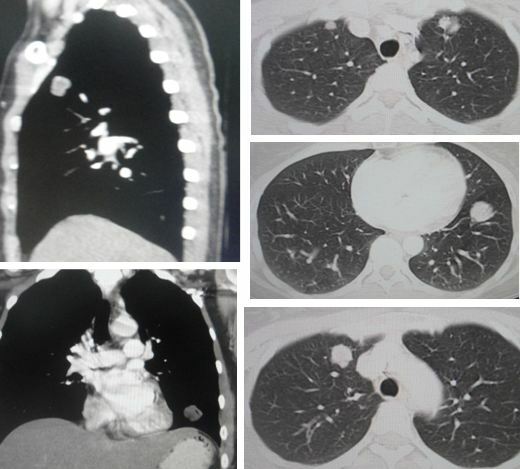 multiple small metastases in both lungs. enhancing lesions at left parietal lobe, vermis and right cerebellum. patchy sclerosis of body of T1 vertebrae suggestive of metastasis. lymph node at level 4 of neck. MRI thoraco-lumbar spine done in Hospital C, 3 October 2017.
abnormal signal intensity within C7,T1 and T2 vetebral bodies. Features suggestive of metastases. Whole body PET Scan done in Hospital C, 18 January 2018.
metabolic activity noted in the right (1.8 cm) and left sides of neck (1.9 cm) . metabolic activity noted in the left base of the tongue. metabolic activity left axillary lymph node (2 cm). irregular metabolic active mass (3.2 cm) seen in the apical segment of the lower lobe of left lung. Whole body PET Scan done in Hospital C, 21 August 2018.
metabolic activity node see in the left (1.3 cm) side of the neck. metabolic activity left axillary lymph node (0.6 cm). FGD-avid mass (4 cm) seen in the apical segment of the lower lobe of left lung. This is larger and has more metabolic activity compared to the previous PET CT on 18 Jan. 2018.
metabolic active nodule (1.9 cm) seen in the posterior segment of the upper lobe of right lung – not seen in the previous scan. another metabolic active nodule (1.7 cm) seen in the posterior basal segment of the lower lobe of the left lung — not seen in the previous scan. a few 2-5 mm, non metabolic active nodules seen in the right and left lungs. These are not seen in the previous scan. increased metabolic activity seen in the left adrenal gland (1.4 cm). metabolic active lesions seen in the spine of C7 and T1. These re larger and more metabolic active compared to the previous PET CT scan. metabolic active bony lesions seen in the spine T12, left sacrum and medial wall of the left acetabulum. These are not metabolic active in the previous scan. You don’t need to be a doctor to know that FY is getting worse, not better, after taking Tarceva. Below is a table with values of CA125, CA15.3 and CA19.9 taken over a period of about a year while FY was taking Tarceva. The most telling results are the values of CA125. In September 2017, the value was 434. After taking Tarceva it gradually decreased to 48 and down to 15 in February. 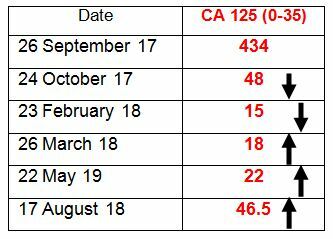 But in March 2018 (barely five months later) the CA125 started to increase and in August 2018 it was at 46.5. The numbers above clearly showed that Tarceva was gradually losing its effective after five months! In August 2018, the oncologist told FY that Tarceva was not effective anymore. He has to switch to i/v chemotherapy and radiotherapy. 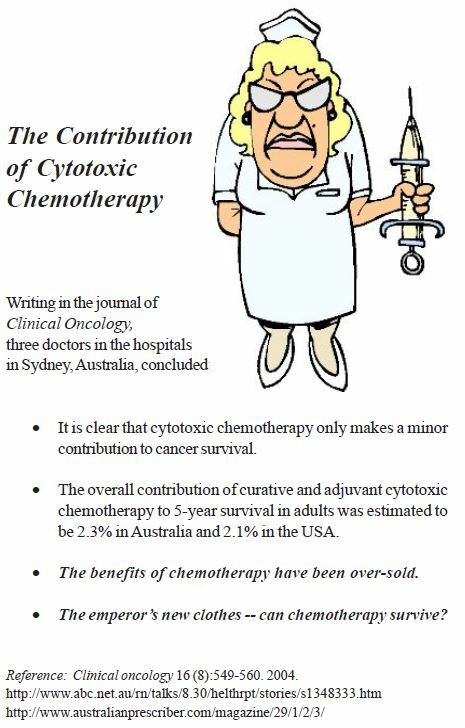 A cycle of chemo would cost RM12,000. If FY does not want chemo, he can opt for another new, more expensive oral drug (probably Tagrisso which cost RM30,000 per month). FY and his wife came to seek our help. They decided not to continue with further medical treatment – at least for the moment. Chris: Can this new drug cure you? This my third case in which patients were asked to take Tarceva for ten months with the promise that at the 11th month onwards they get Tarceva without charge for life! 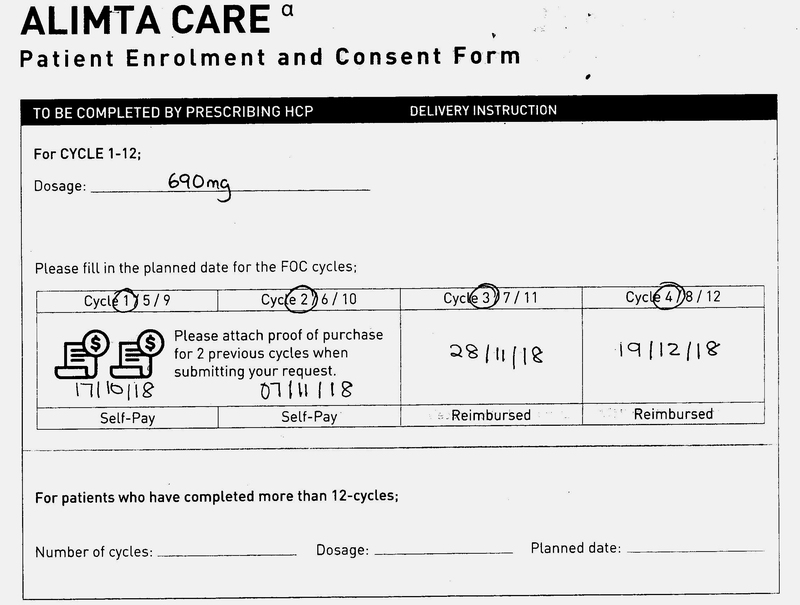 Do you ever wonder why patients are offered Tarceva for free, after being told to buy a ten-month- supply first? 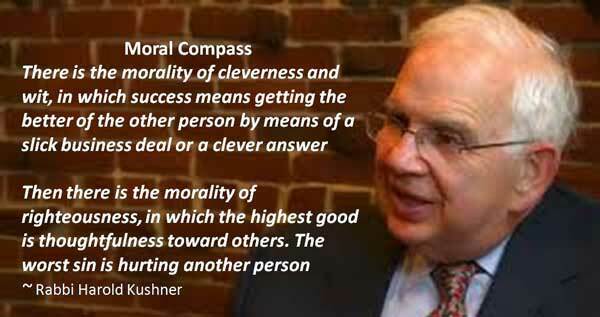 Is it a noble, charitable intention or “smart” business deal? Daughter: My father has lung cancer. It is positive for EGFR. The doctor suggested taking the oral targeted therapy, Tarceva. One box, lasting one month, cost about RM8,000. After we take Tarceva for ten months, and if the medicine works, for the rest of his life the medicine will be free. But must complete the ten boxes first. That’s the deal! C: I have one patient who came and see me. She was asked to take Nexavar (for liver cancer). The deal was buy one, free one. But must pay RM20,000 first (for the first month’s supply) and next month she will get one month’s supply of Nexavar for free! But after she took the drug for a week, her health deteriorated, had to be hospitalised and she died. Already paid RM20,000, cannot claim back. Another question that bugs me is, why free only after TEN months? Why not earlier? Why not buy one, free one like they offered for Nexavar? Let’s study the blood test numbers critically. Let’s look at the bigger picture. The CA125 was at 434 in September 2017. After taking Tarceva the value dropped to 15. Bravo! Tarveca seemed to do the magic. But this euphoria did not last long. A month later, in March 2018, the CA125 started to increase. By August 2018, it was at 46.5. By offering patients free Tarceva after ten months, seems appealing and noble at the first look; but in reality does the drug company or doctor not know that by a few more months, patients don’t need Tarceva anymore because it is not effective? From a business point of view, it also does not make “sense” why the drug company would give Tarceva for free. Business is to make money. Just imagine what could happen if all patients get free Tarceva for life — will that not make the drug company go bankrupt? When I started to ask these questions, I became more curious. To kill the curiosity in me, I googled cost of generic Tarceva in India. In India you can buy a month supply of generic Tarceva for less about RM563. Wow, amazing — I learned something new today! At one time Tarceva was selling for RM 8K per month. Now the price dropped to RM5K — and that is still many times more expensive than the Indian generic. I have another question. I wonder why the Power-that-Be in developing countries do not look to India for the cheaper, generic drugs? Is that not a good way poor for poor countries to save money? If you are skeptical about this suggestion, that is okay. Go ahead and spend your money. But if you are poor and cannot afford to buy these expensive, American drugs, I believe my suggestion makes sense. Take this case, FY paid for the “expensive original” Tarceva, right? For less than a year, he already spent RM45,000. Look what happened to him? 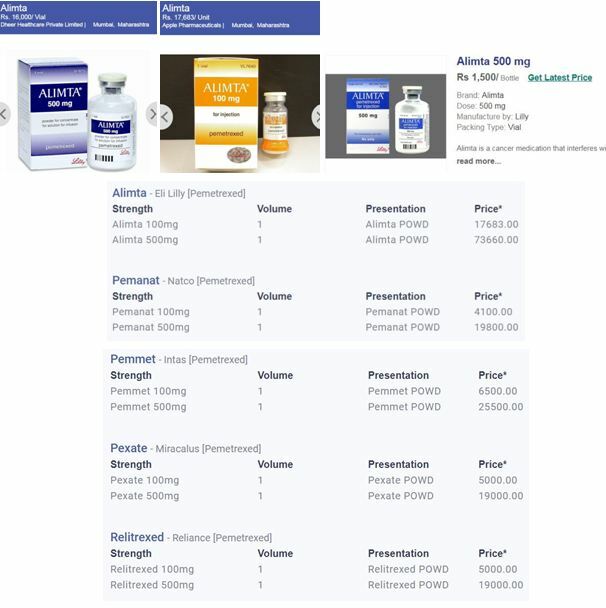 Alimta for lung-liver-lymph nodes-bone cancer: Buy two, free two. If you make it to 12 cycles, free for life! A young couple came to me on behalf of his father. The young man sounded very disorientated. I could not figure what he was saying in his soft voice. Luckily he brought along his wife who could present their father’s case clearly and logically. Ono (not real name) is a 64-year-old. He lives in an Indonesia town about seven-hour-bus ride to Kuching, Sarawak. Ono’s problem started about four to five years ago when he had abdominal problems. 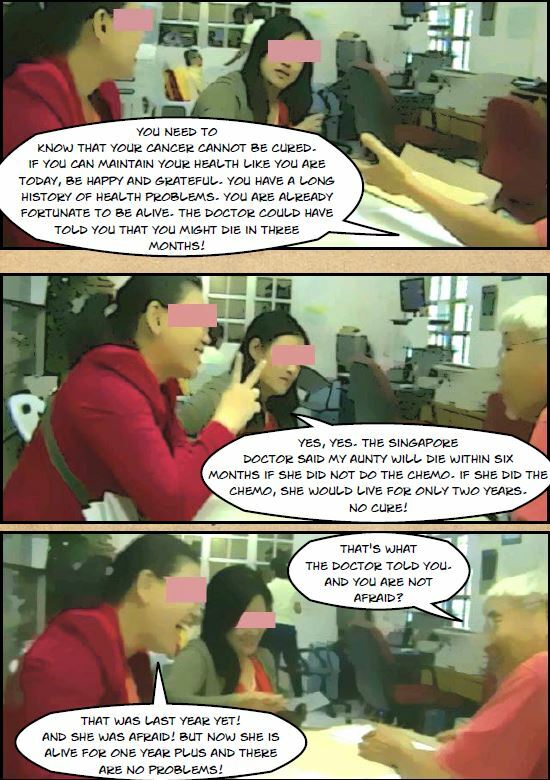 He consulted a doctor in a private hospital in Kuching. According to the doctor there was stone in his gallbladder. He was told not to worry and was sent home. About two to three years later, Ono suffered a mild stroke. He was given medication and was okay after that. In July 2018, Ono had severe abdominal pain with cold sweat. According to the daughter-in-law this was not due to gastritis or wind in the stomach. In mid September 2018, Ono went to a private hospital in Kuching. An USG showed his gallbladder had pus and there was infection of the liver. Ono underwent an operation to remove his gallbladder. A pathology report indicated a perforated gallbladder with malignant glands. It was a moderately differentiated adenocarcinoma. Blood test on 10 September 2018, showed elevated liver function enzymes. 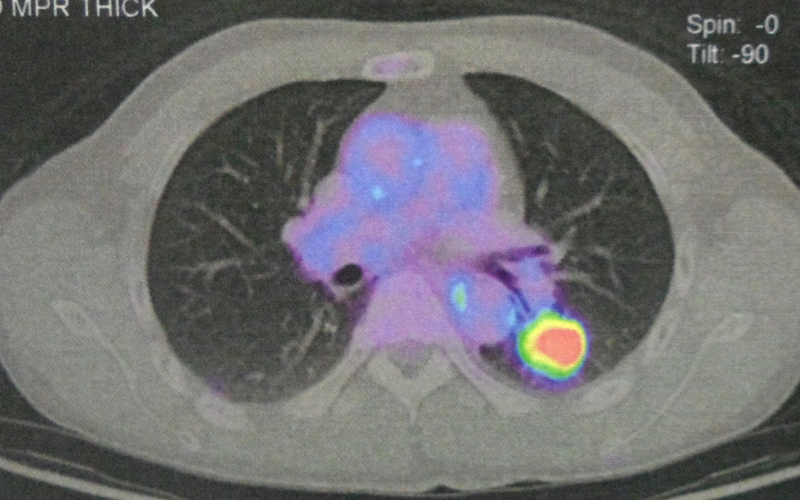 right upper lobe lung mass (2.3 x 3 cm), likely tumour, metastasis. small left lower lobe nodule, likely metastasis. right hilar and mediastinal lymph nodes. right upper lung lobe mass — moderately differentiated adenocarcinoma. subcarinal lymph node — no malignancy. Another report C2354-18 on the same date, subcarinal lymph node aspirate: few atypical cells that are suspicious for carcinoma. T4 pathological facture causing compression on the thecal sac and spinal cord. 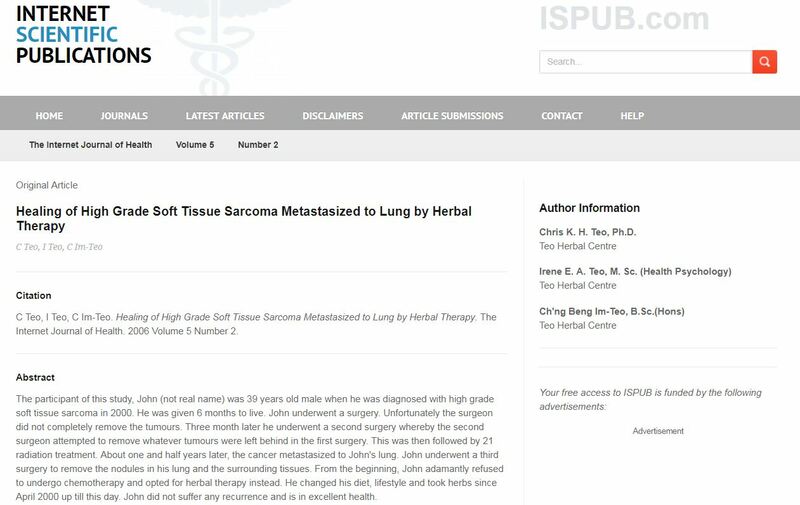 T2 – T7 and S1 – S2 metastatic vertebral lesions. mild L4/5 posterior disc bulge. EGFR PCR 6 October 2018: None of the mutations were detected. 11 October 2018: Tumour cells do not demonstrate a staining reaction to ALK-1. Ono was referred to the oncologist for follow up. He underwent one cycle of chemotherapy using Alimata, dosage 690 mg. The total cost per cycle is RM8,500. Ono was told that he might need to go for four to six cycles. Was Ono better after the first shot of chemo? According to the son, he had less pain but he is still in great pain. The pain was in the chest. It was more severe at night than daytime. Ono’s son said he had to massage his father’s legs throughout the whole night to make him comfortable. In fact that was the reason why he was so disorientated when he came to see us due to lack of sleep. Ono had no energy and need to lie down all the time. His breathing was difficult. I had to be up front with Ono’s children. I said, I cannot cure your father. Actually I told them to go home and continue with the chemo if they want to. Either way, the outcome would not be different. Ono’s children was very disappointed. They wanted to try the herbs. At CA Care I learn many things each day. Today’s lesson is something I did not know before until I encounter Ono’s case. So the total cost of the chemo-drugs is RM7,311.50. The remaining RM1,209.20 is the cost of hospital care inclusive of RM500 oncologist’s fee. There are two interesting points to highlight after studying the detailed medical bills. From the above, for every two cycles of Alimta, Ono will get the next two cycles free of charge. So it is like buy two, free two. And the offer gets even more attractive after that. If Ono could make it to a total of 12 cycles of Alimta, he will receive free Alimta for life! One point that bothers me is this, does the offer: buy two free two and after 12 cycles you get free for life, really makes business sense? Like the Malay saying, ada udang disebalik batu? (is there a prawn behind the rock?). I am sure you are smart enough to come to your own conclusion. Why not use generic Alimta from India? Ono paid a total of RM7,160 for Alimta. Just for curiosity, what would this generic drug cost in India? In India you have a choice between the expensive and cheap generic Alimta. The generic Alimta cost one-fourth the price, Rs 23,990 to Rs 24,000 (or RM1,359). Indeed if the Power-that-Be in the developing countries is wise, why don’t they opt for the cheaper generic drug from India? But you may say, the Indian stuff does not work. The American one is better. Really? Take a look below. In addition to Alimta, Ono also received carboplatin. The oncologist in Kuching did not use the American stuff. 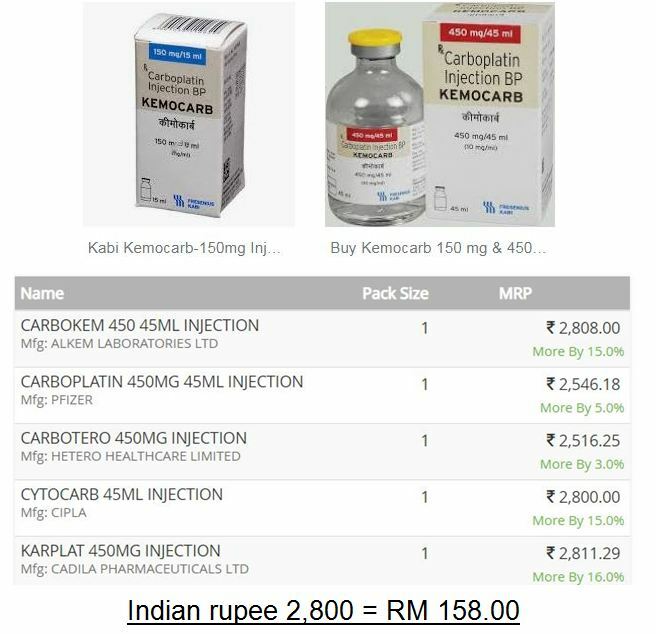 He used generic carboplatin from India called Kemocarb. Ono paid only RM151.50 for this generic carboplatin. 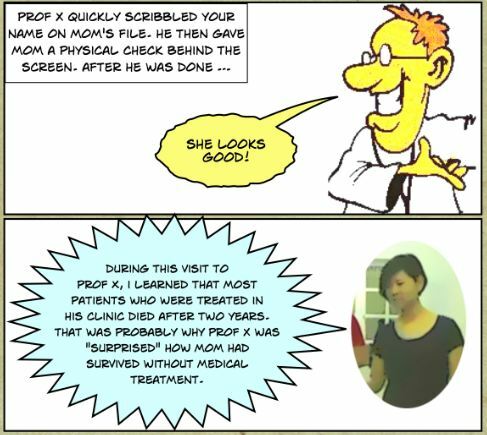 Great doc., you tried to save money for your patient. That’s the way to go! Lung Cancer Part 2: Treatment with Tarceva and Zometa failed — what now? For 13 months, GG was treated with Tarceva and Zometa for her lung cancer. About seven months on Tarceva and Zometa, GG started to have serious problems: double vision, eyes highly sensitive to bright light, ear ringing, legs with no strength, severe muscle pull at the neck. GG did ask the doctors if the sufferings that she had to endure was due to the side effects of the treatment, i.e. due to the Tarceva and Zometa. 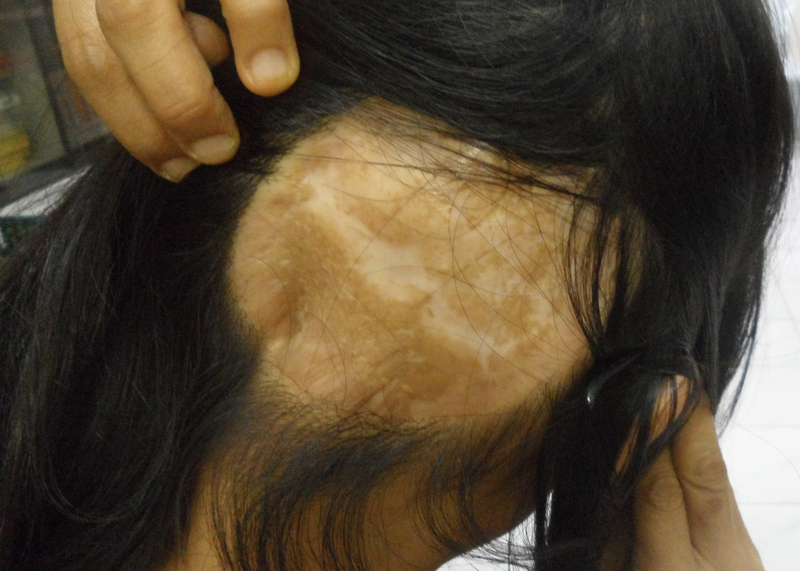 The doctors categorically denied that her suffering was NOT due to the treatment! GG told us that in the next few days, she would have to see her oncologist again. Since Tarceva is not effective anymore, she will be told to take another new drug. Because of the severe headache, she would consult the brain specialist again. All along, MRI showed nothing in the brain. Sensing that GG is still not done with her doctors yet, I suggested that GG go and see her doctors first. There is no need to panic or rush to do something. I told GG to find out in more detail what the oncologist has to offer her. The oncologist had indicated earlier that GG might be prescribed a new drug. This is more expensive (about RM10,00 per month). She will have to pay for this — so the deal of free Tarceva for life vanished. For this new drug, besides the cost, I reminded GG to ask if it can cure her or not. GG quickly responded, “But I cannot afford” to pay for the treatment anymore. After all she had spent more than RM100K thus far. She is running out of funds. 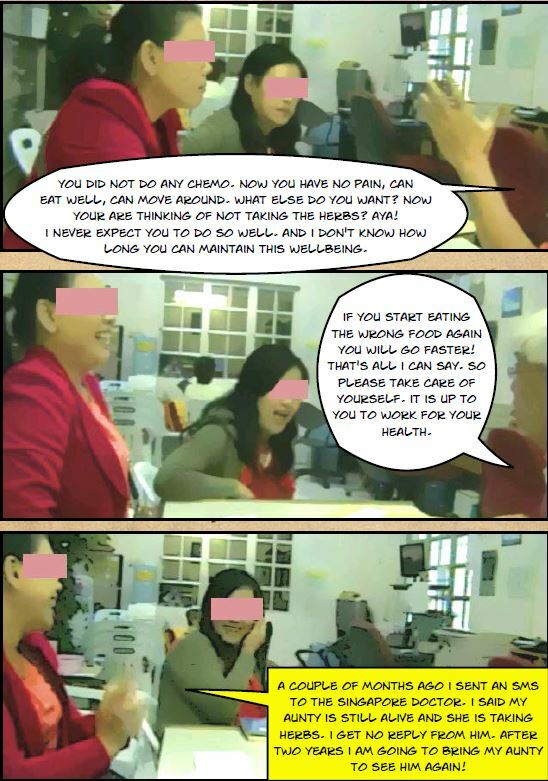 Her health insurance would only pay RM50K per year for her medical treatments. I assured GG and if everything else fail, she can come and see us again. I shall do my best to help her. I warned GG that our CA Care Therapy is not easy to follow. The herbs has to be boiled. It is smelly and taste awful. Besides she cannot eat anything she likes. No oil, no sugar and don’t eat anything that walks (i.e. with legs). Then my last shot. I asked GG whom she prays to. GG prays to Kuan Yin, the Goddess of Mercy. I suggested that GG go home and pray first and ask Kuan Yin for guidance — whether she should continue with the medical treatment or opt out of medical treatment and start following our therapy. In this way, no one can make us a scapegoat if GG never get well or die. Two days after sending GG home without any herbs, GG came to see me again. Chris: Did you talk to Kuan Yin? What did she say? GG: It is okay to take your herbs. Decide for yourself how truthful it is the doctors when they told GG about the side effects of the treatment. Is it the whole truth? Read what doctors say about themselves. So, don’t swallow everything that the doctors say. Google side effects of Zometa / side effects of Tarceva and see what you get! Let me share with you what I got. Do you need to pay RM100,00 to collect such possible side effects? Think carefully — why do you think GG is suffering so badly now? My last word. If I have a choice, I would rather NOT take on this case. I am not sure if GG is here just wanting to hunt for a magic bullet. I cannot cure her. But I have no choice. I have to help GG the best I know how, if she is committed to her healing. Let’s see if she turns up again in the next two to three weeks. From what I can see, right now she is in severe pain and discomforts. My prayer: Oh God, please give me the wisdom to make her life a bit more comfortable. GG is a 59-year old Malaysian lady. 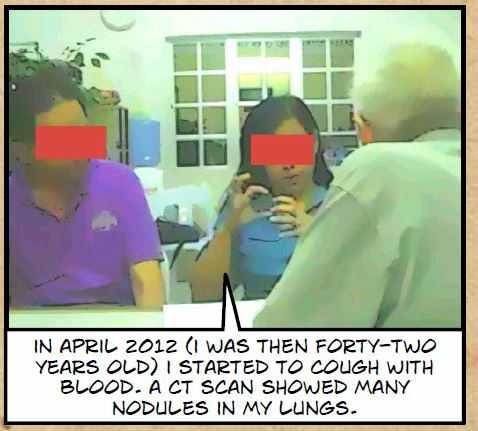 About four years ago (June 2014) she had a bit of cough. She consulted a GP who said there might me something in her lung. 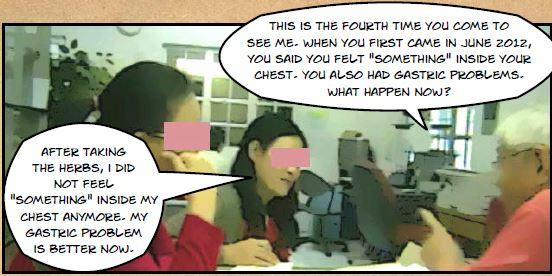 GG was asked to consult a lung specialist in Hospital A in Penang. A CT scan on 5 June 2014 indicated mild fibrosis in both lungs. There was a 1.6 cm nodule in the right lower lobe, likely benign in nature. 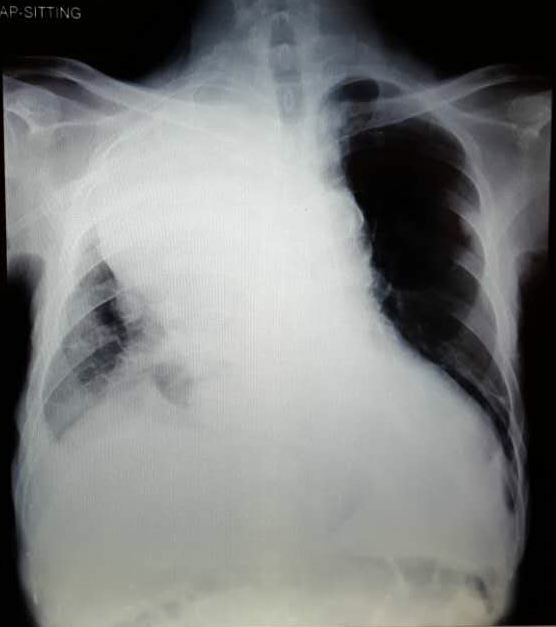 Minimal atelectasis (collapse or closure of a lung resulting in reduced or absent gas exchange) in the right lung base. Conclusion: Features are suggestive of infective process, such as tuberculosis. GG was sent home without any medication. Unfortunately, GG did not get any better in spite of returning to see her doctor again and again. Her tongue became crooked. GG went for acupuncture. Great! Her headache went away and her tongue became straight again. The acupuncture treatment was for about two months. 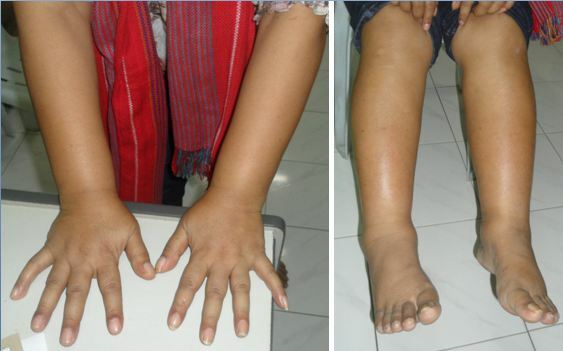 She received two treatments per week. Each treatment cost RM 8.00. Unfortunately again, GG’s problems did not go away. In September 2017, she developed severe headaches and could not stand the pain. She started to cough, especially at night. GG went to consult a neurologist in Hospital B. A scan showed nothing in her brain but there was a 2.6 x 2 x 2.5 cm mass in the left upper lobe of the lung. There was also a 2 x 1.6 x 2 cm mass in the right lower lobe. There was partial collapse of her T3 vertebra. There were lytic and sclerotic lesion seen in the right 6th rib and the left 10th rib. A core needle biopsy of the lung mass was done. The result confirmed cancer — an invasive moderately differentiated adenocarcinoma. GG went for a second opinion in Hospital C. A PET scan was done followed by a biopsy again. The PET scan results suggested primary lung cancer with metastasis to the perihilar node and multiple bony metastasis involving the spine, pelvic bones, bilateral ribs, right skull base, left scapula and left humerus. A tissue specimen sent to Kuala Lumpur for further analysis indicated positive for EGFR gene mutation. GG was started on oral drug Tarceva in October 2017. And she had been taking this drug until now. GG had to pay RM5000 plus per month for this medication. In addition she received monthly Zometa injection for her bone. This cost about RM1500 per month. Chris: Did you ask the oncologist if these treatment can cure you? GG: No, cannot cure. Can control only. C: How long do you need to be on the medication? GG: Take Tarceva until I die. When GG came to see us, she was already on Tarceva for 13 months. The oncologist offered an interesting deal. GG has to buy Tarceva for 10 months. After that she will be given free Tarceva for life. In other words, spend $50 to 60K on Tarceva first and then you get whatever Tarceva you need for life. For the past three months GG received free Tarceva but had to spend about RM300 per visit on hospital expenses. Unfortunately, about two weeks before she came to CA Care, GG had to be hospitalised for ten days. This cost her RM21,000. 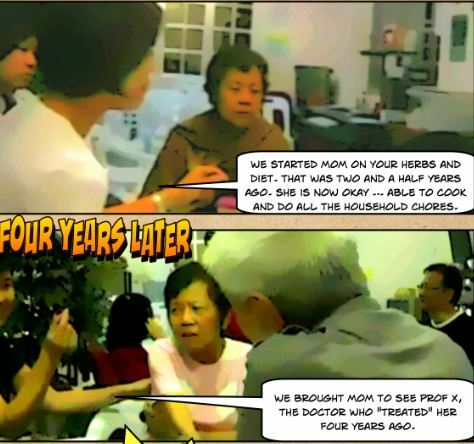 All in all, up to this point in time, GG said she had already spent RM100,000 for her medical treatments. Never mind, insurance pay! C: Why do you come and see us. Why don’t you continue taking the Tarceva. After all it is for free now! GG: The oncologist said Tarceva is not effective anymore! I need to change to another more expensive drug. And this time I need to pay for that drug. It will probably cost RM10,000 per month and I cannot afford that. C:Did you suffer any side effects while on Tarceva? GG: Initially there was a bit of hair loss. My skin was dry and there was a bit of itchiness. After about seven months on Tarceva and Zometa, I started to have more serious problems. Double vision. If I close one eye, it is okay. With two eyes opened it is havoc. Cannot stand the bright light with my eyes opened. Both ears with ringing sound. Severe muscle pull at the neck. C: Did you have such problems before taking Tarceva? Indeed when GG came to see us she was really in a bad shape. She could not sit up for long and needed to lie down. Her son pushed her around in a wheel chair. I asked GG to leave behind her stack of medical reports and CDs of the scan. I need to do some “homework” to understand what had happened. One month after commencing Tarceva, GG had a CT scan. Did the tumours in her lung disappear? As shown by the scan below, there was no magic. One year after consuming Tarceva, CT scan showed GG’s condition did not get any better either. 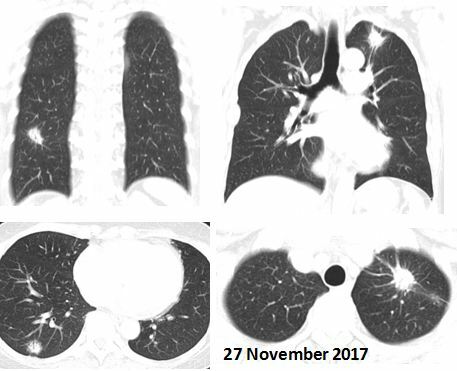 Study the images (above and below) and see for yourself that the tumours in the lungs did not go away. 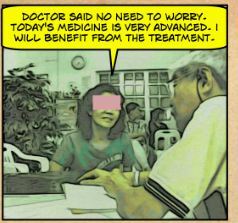 GG had been a RM1,500-Zometa-injection every month. Her bones did not get any better either. 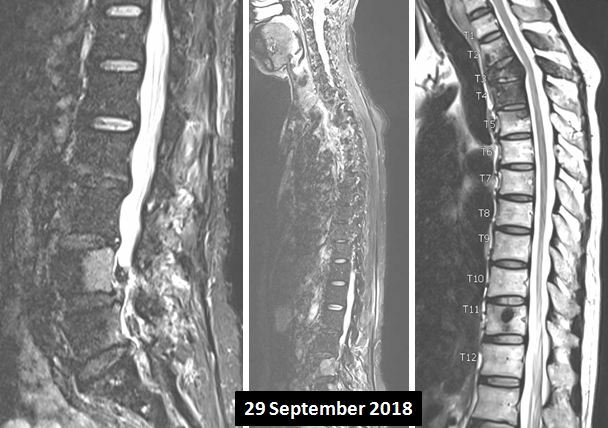 MRI in September 2018 showed severe compression fracture of body of T3 vertebra and sclerotic lesions in bodies of T2, T3, T4, T5, T6, T7 and T11 vertebrae. Every month, GG did blood test and her CEA, CA 153 and CA 19.9 were monitored. The results (as in tables below) were disappointing. In September 2017 when GG started seeing her doctors in Hospital B, her CEA was only 11.7. Then GG started to take Tarceva prescribed by an oncologist in Hospital C. The CEA increased to 58.6. Over the months, even with Tarceva, the value fluctuated. It August 2018 (after almost a year on Tarceva) it was 42.5. In September 2018, it was 14.8 (Table below). 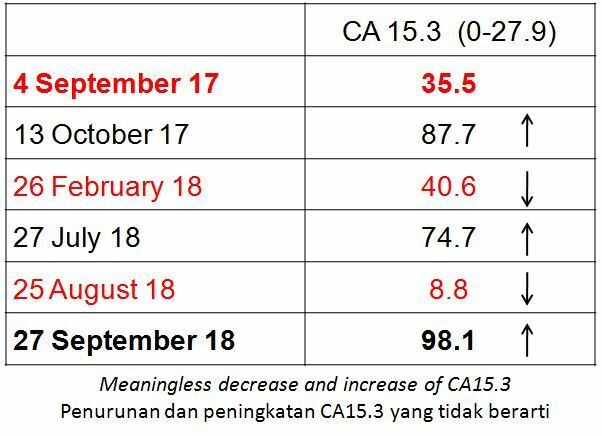 The rise and fall of CA 15.3 and CA 19.9 showed similar trend. Look at the big picture. GG started off with CA15.3 = 35.5 and a year later it was 98. 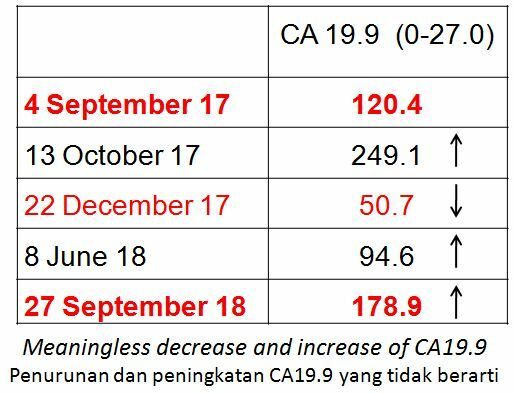 For CA 19.9, it was at 120.4 in September 2017 and it was at 178.9 in September 2018. You don’t need to be a doctor to know that the treatment did not work. GG needs to try her luck elsewhere. If she continues with the medical treatment, she was told that she needs a new, more expensive drug. This time she has to pay for the drug. Her dream of enjoying free Tarceva for life turns out to be just a “crashed dream” or an illusion. Patient said her condition had improved after taking herbs but doctor said she had deteriorated! 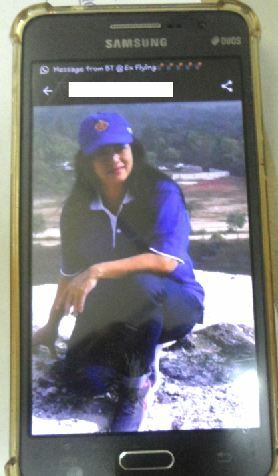 YN is a 54-year-old Indonesian lady. She had problems with her lungs. The doctor in Surabaya diagnosed it as TB. YN had been taking TB medication for the past seven months. Her condition did not improve. YN then did a CT in May 2008. 8 x 5.5 x 5.5 cm mass in right lung. 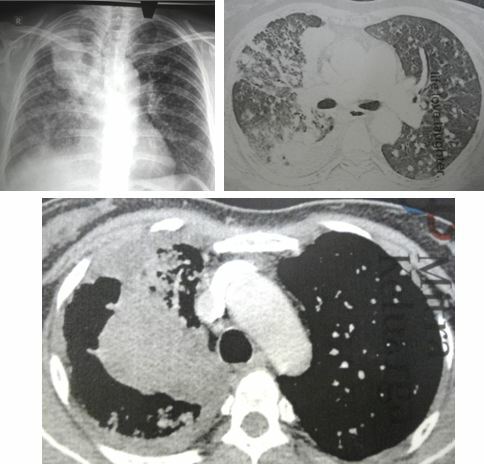 Segmental atelectasis, that is collapse of one or several segments of a lung lobe. Multiple subcentimeter nodule in both lungs. Subcentimeter lymphadenopathy (swelling of the lymph node). YN came to the cancer hospital in Penang. The doctor wanted to perform a biopsy and if cancer is confirmed YN will have to undergo chemotherapy. YN refused further medical treatment and came to seek our help instead. Chris: Why don’t you want to go for chemo? YN: My late husband had colon cancer and had surgery in Singapore. 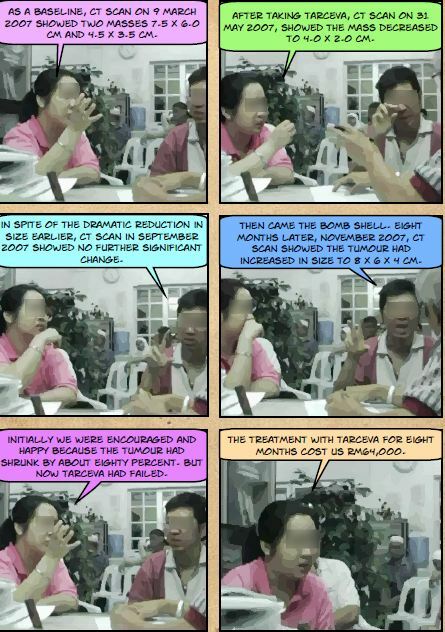 Then he had six cycles of chemotherapy at another private hospital in Singapore. He died immediately after receiving the sixth treatment. In all we spent about 1 milyar (one thousand million rupiah) for his treatments. And he died within six months after his diagnosis. C: Did the doctor say chemo can cure your husband? YN: Yes ,he said chemo can cure! So, I don’t want any chemo. I shall try your herbs and if they help me, I shall come back to see you again. Having seen the CT scan (above) I explained to YN that taking our herbs would NOT cure her at all. To help her may be but to cure, no. YN understood this. I was a bit more curious. Most Indonesian men smoke and ended with lung cancer. YN does not smoke. What about her working environment? She sells things at a store in the market. YN told me that in 2011, she had a hysterectomy in a hospital in Jakarta. Was it cancerous? YN did not know. Then in 2013, she had another operation to remove her ovary. Again, was it cancerous. YN did not know either. 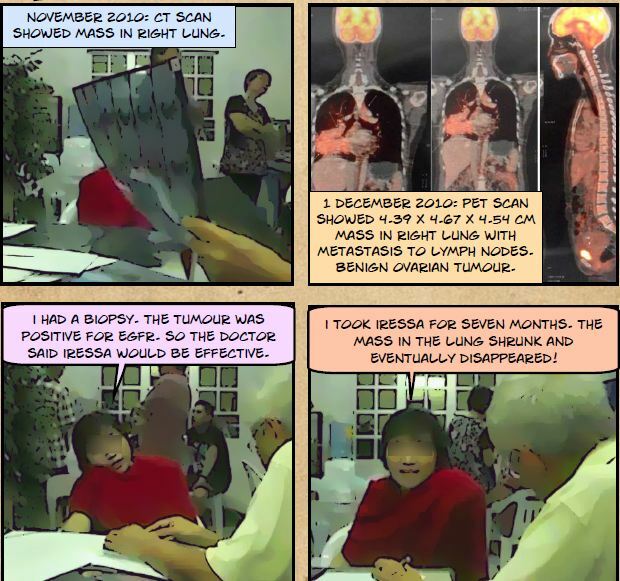 Looking at the scan and know her medical background, it appears to me that YN has metastatic lung cancer — I cannot figure out how the doctor ever diagnose her with TB. YN came back to see us again after taking the herbs. Her condition has improved very much. All pains throughout the body were gone after taking herbs for a month. Before the herbs, she had pain all day long. She used to have pain in the left side of her chest. This was also gone. She was still unable to sleep due to the coughs. Unfortunately the Cough 5 and Cough 6 that we prescribed did not work for her because each time she was taking only one TEAspoonful instead of the recommended 2 or 3 TABLEspoonful. YN was not able to sleep flat and needed to be propped up when lying down. For this, I suggested that YN add in Lung Phlegm into her lung tea. The problem could be due to fluid in her lung (pleural effusion). YN does not feel tired anymore after taking the herbs. She can also climb up the stairs. Before this she was always tired and unable to climb up the stairs. The problem of wind in her stomach disappeared after taking our Gastrovit herb. Breathing is normal now. Before YN was breathless. Before seeing us, her right ear oozed out blood. This happened about once in every two weeks. After being on our therapy, this problem resolved. Before YN came to see us for this second visit, she did a chest X-ray. According to the doctor her condition had deteriorated and she has much “less hope” now compared to before. Chris: Before you came, did the doctor say medical treatment can cure you? Any hope? YN: He said I have no hope. Now, he said I have much more “no hope”. C: Two months ago, before taking the herbs, you had so many problems. And now most of the problems are gone. You are much better now. And the doctor said you have even LESS hope now. Do you believe what he told you? YN: No, I never believe him. 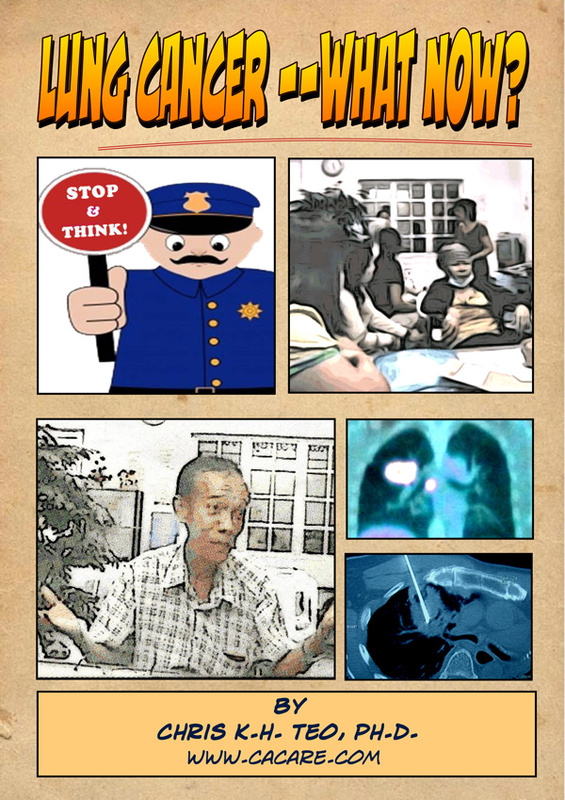 Lung Cancer Patient from Selat Panjang — still alive and healthy? I once asked an Indonesian patient who came to see me. Do you know where Selat Panjang is? He shook his head — No. Well, I don’t expect him to know — the Indonesian archipelago has 18,307 islands! But I am glad to say that over the years taking care of cancer patients, my geography about Indonesia has improved a notch! I know where Selat Panjang is — because I have patients who come from that Riau islands. Let’s watch this video first. When patients come here for the first time, I normally ask a few general questions, such as Where are you from? Who ask you to come here? Here are some lessons we can learn from my conversation with this lady (let us call her Alice) from Selat Panjang that morning. From her hometown, Selat Panjang, Alice had to take a three-hour plus ferry ride to Batam. From Batam, it was another two-hour plus ferry ride to Johor. From Johor she took a ten-hour bus ride to Penang. Unfortunately, Alice got off at the wrong place! This was her first time in Penang — a real daring adventure! Over the years, I learned that some other patients need to travel for one or two days just to reach Penang. They had to take a train or bus for hours to the airport and then fly to Penang. Some patients had to change planes one or two times to get to Penang. I really feel sorry for people like Alice who has to travel so far and so long just to come and seek our help. So, those of you who live nearby, consider yourself lucky or blessed. You need not have to suffer such “ordeal” to come and consult us. I used to joke with some patients. Some patients just have to drive across the Penang Bridge to come and see us and that they consider “very far away”! To others, taking one- or two-hour plane ride is considered “far”? Think about Alice and others like her! Who ask you to come and see us? Alice came because someone in Selat Panjang told her about us. About three years ago, a lady came to seek our help on behalf of her father who had lung cancer. The father was bed-ridden and was unable to move his bowels and urinate. This lady brought back some herbs for her father. He was also told to take care of his diet. Within two weeks he got better. It has been three years now and he is still alive and healthy. Can you believe this story? To be honest, I don’t. More often than not, people tend to exaggerate their “success”! So I took some time trying to get more details from Alice. Did you really meet this patient? Yes. Alice met and talked to the patient himself. This patient made a photocopy of our name card and gave it to Alice. Up to this day, Alice said the man still takes care of his diet. I asked Alice if he is he really alive and healthy? Yes, he puts on weight and is not a skinny, half dead person! Really still alive? Yes. If you ask me if a bed-ridden, lung cancer patient would survive that long my answer would probably be no way. The condition of Alice’s father is almost the same as this man, both of them have lung cancer and are bed-ridden. One important lesson I learned about helping patients is the need to share. 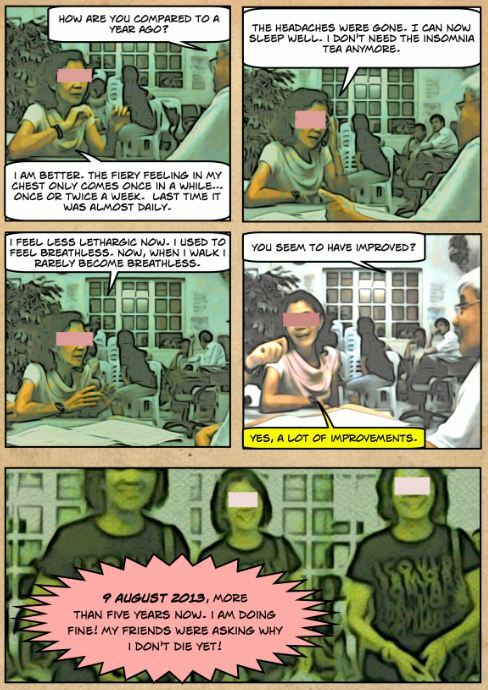 When we started our cancer centre in Penang, the first thing I did was to knock down the wall of our consultation room to make it an open space. I see patients in this open hall. Why? From the very beginning I believe that we are all in here together — you and me, and many other patients who come to CA Care for help. There is nothing to “hide” from each other — let us learn to share and help each other. When I first started CA Care in 1995, I knew nothing about cancer. I did not even know the difference between radiotherapy and chemotherapy let alone know what herbs to prescribe for various cancers. 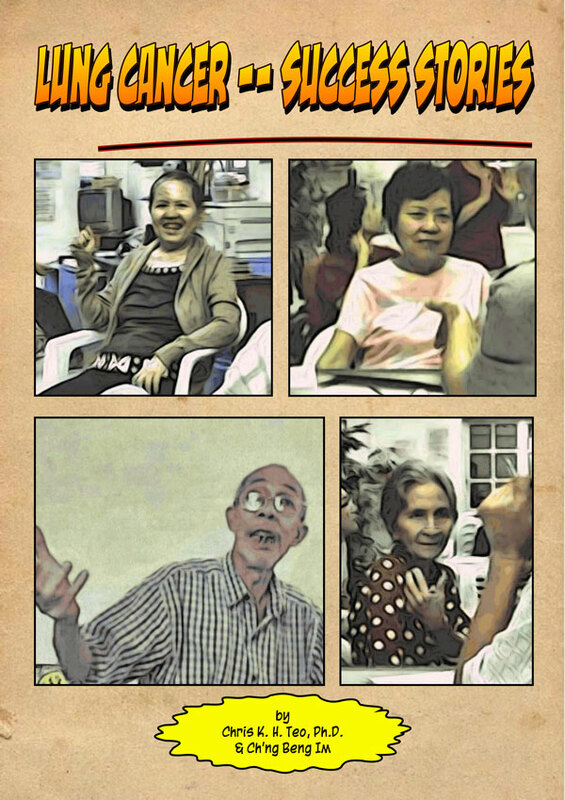 With time I read a lot and learned from the experiences of patients who came and shared their experiences. My patients taught me how to heal them! I in turn shared those experiences to help others. As I said, we all are in here TOGETHER. And this how CA Care grows. 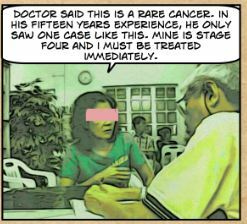 I am glad to learn that this lung cancer patient in Selat Panjang decided to share his healing experience with others who need help. It is noble of him to help his fellow islanders! Over the years, I must say that 99.9 percent of the patients are very co-operative. They are willing to share their success stories. It is because of this willingness to share that makes CA Care what it is today. However, over the years, I have also come across some “rotten apples” who don’t want to share. They even ask me to delete their stories posted in the website. So be it, I respect their wishes. Luckily, such rotten apples are rare, otherwise I would have closed CA Care years ago! Alice came with a strong feeling that we could help her father. Her father has lung cancer that has spread to his bones. Because of that he is bed ridden. According to the oncologist, without chemo her father would die within six months. I was upfront with Alice and I did not want to play god in this game. I told Alice I would not be able to cure her father. I would not be able to repeat the success that happened to the patient who introduced her to us. Remember what happen to others, need not happen to you. What happen to you need not necessarily happen to others. In cancer, your healing or failure is uniquely yours. I am also aware that one of the sales tactics, to push more treatment to patients, is to instill fear into them. Make patients helpless and you can pull them by their noses — tell them to jump into a pit, they would willingly do it. I would not want to do that. Alice has come all the way to seek help. She deserved to receive the best from us as honestly as we can provide. After spending some hours with Alice, I asked her to relax, go back to her hotel first and call her family in Selat Panjang to explain what it takes to embark on this healing journey. It is not easy. If her father is not willing to follow our advice, it is better not to take our herbs. No, we do not wish to putting any fear into the family by rattling out meaningless statistics or create a do-or-die situation. Be calm and think properly. Healing needs a strong sense of commitment. Nobody can help you except you yourself. I am glad that Alice understood this. She took time to talk to her father and family. The next day she came back and said she wanted to try our therapy. For the rest that follows, I pray that God will guide and bless the patient. Sarcoma: Without chemo die within 6 months! Six years on CA Care Therapy, still alive and well! A few days ago, just before the Chinese New Year (2018), a couple from Indonesia came to seek our help. The husband, 58-years old was diagnosed with liver cancer. As usual, my first question to patients who come to see us for the first time is, Who ask you to come here? The wife answered, H asked us to come and see you. Chris: Oh H. When did you last saw her? Is she still alive? Still healthy? Answer: Yes, she is doing very well. We communicate through handphone. This is her picture she sent me yesterday. C: I am really glad to know that she is alive! When you go home please tell her that I was thinking of her. I have not heard from her for a long time. I thought she had passed away. Listen to this conversation this morning! What is so special about this case you may want to ask. Oh yes, very special indeed. About 6 years ago, H was diagnosed with a rare cancer — sarcoma “sitting” on top of her lung. 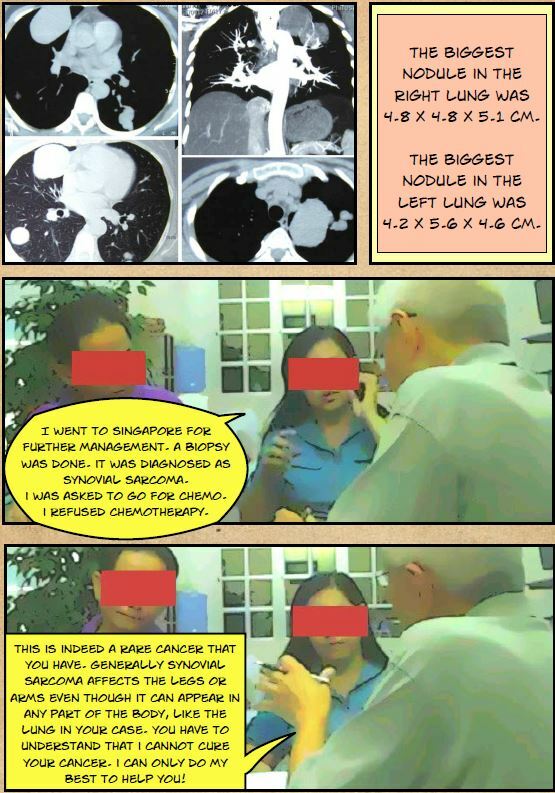 The oncologist in Singapore said, Without chemo, 6 months to live. With chemo, you may live up to 2 years. But no cure. H refused chemotherapy and came to seek our help instead. She was well. But we did not get to see H for some time already. The question in my mind, How is she doing? Still alive? Probably dead. So, this is a miraculous case — thank God for such a blessing! Below is her full story. MS is a 68-year-old man. About four years ago, he had colon cancer. He underwent an operation but did not undergo follow-up chemotherapy. He went on vegetarian diet. His cancer did not go away. CT scan done on 1 August 2016, showed large mass in his right lung measuring 10 x 7.4 x 10.0 cm in size. It invaded the mediastinum. There were also multiple smaller lesions in the right and left lungs, measuring up to 2.4 cm. MS did not receive any more medical treatment and opted for supplements. He took Transfer Factor, Probiotics, Tea4Life, etc. MS became breathless. X-ray done on 29 August 2016, showed a 12.0 x 9.0 cm mass with pleural effusion (fluid in the lung) as below. Ultrasound guided drainage of the lung fluid was done. Blood test showed the following results. MS stayed at home and took whatever supplements, but these did not help him. On 3 January 2017, a son of MS came to seek our help. I was told that MS had difficulty breathing and his face, hands and legs were swollen. He was not able to lie down flat when sleeping. This was what I told his son: This is a serious case and there is no cure. Let us try to tackle the problem slowly. First is to try and resolve this swelling and also get rid of the fluid in his lungs. MS was prescribed Lung 1, Lung 2 teas plus Lung Phlegm. In addition he was given Upper Edema tea. Wonderful results: Listen to what his son told us. Swelling of the face, hand and feet were gone after taking the herbs for three days! He coughed out a lot of phlegm (effect of the Lung Phlegm tea). Comment: We often tell people that we are not magicians and we cannot do magic. But sometimes that in this special case, magic did happen. It is beyond our expectation even though we have seen such results happened many times before! Praise God for this wonderful blessing. Jack (not real name) was 43 years old when he was diagnosed with lung cancer. His problem started in October 2013, when there was a swelling in the right collar bone. Apart from this, there was no other symptoms — no cough, etc. Jack said in 2013, he had fevers on three occasions that make him feel tired. An irregular lesion in the right lung apex, 35 x 42 x 28 mm. Speckles of calcification in both lungs upper lobe suggesting prior tuberculous infection. Bilateral supraclavicular lymph node 10 to 20 mm. Multiple enlarged mediastinal and right hilar lymph nodes. 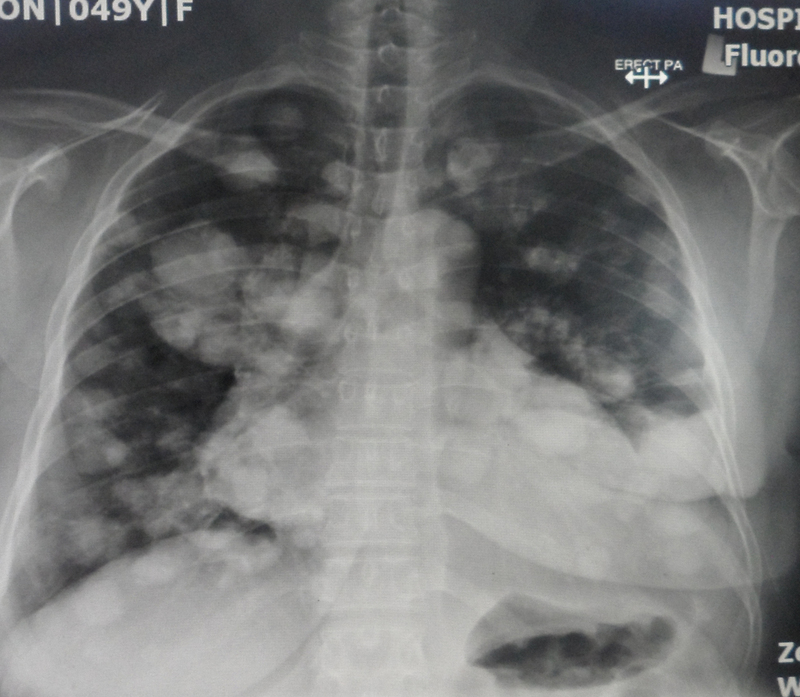 Numerous small nodules in both lungs – likely metastases. Liver shows a least 7 hypodense lesions, largest 30 x 32 mm in the left lobe – likely metastases. Multiple enlarged lymph nodes in the celiac and paracaval regions. 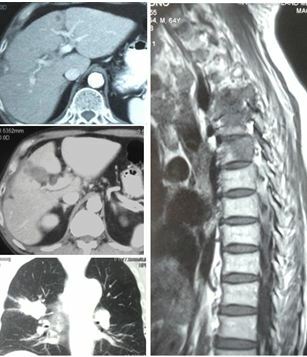 Sclerotic lesions at vertebral bodies of L3, L4 and L5 – likely metastases. A tru-cut biopsy of the right lung mass was performed and confirmed a moderately differentiated adenocarcinoma. Jack underwent 6 cycles of chemotherapy. The drug used was Cisplatin. Each cycles cost about RM10,000. The treatment lasted until February 2014. Let’s follow the progress of Jack’s treatment. Table 1: Blood test results during chemotherapy. At this stage, chemotherapy was very effective and helpful. Alkaline phosphatase declined. Platelet count was down and CA 19.9 decreased from 9,524 to 195. Bravo – great results. After the completion of chemotherapy in February 2014, Jack was put on the oral drug Tarceva. He was on Tarceva until June 2015. His tumour markers – both the CEA and CA 19.9, continued to decrease (Table 2). Table 2: After intravenous chemo, patient was on oral drug, Tarceva. Six months on Tarceva (from February 2014 to August 2014) the CEA and CA 19.9 decreased significantly.Again, great results! From April 2014 to December 2014 Jack also received 6 to 8 monthly injections of Denosumab. This is a monoclonal antibody used to treat bone cancer. It is also known by its brand name, Xgeva and Prolia. Table 3: CEA and CA 19.9 started to increase even though Jack was on Tarceva. From September 2014 both the CEA and CA 19.9 started to increase in spite of Jack being on Tarceva. 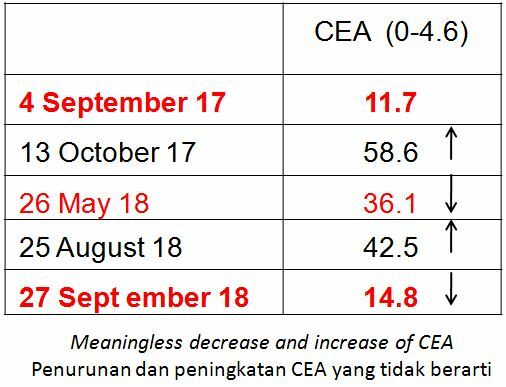 In September 2014 the CEA was 2.2 and it increased to 12.6 by December 2014. Similarly, CA 19.9 increased from 7.2 to 27.9 during the same period. Because of the rising CEA and CA 19.9, Jack was again given 4 cycles of chemo. This time the drugs used were Carboplatin + Gemzar. The total treatment cost RM40,000. Table 4: The second round of chemo with Carboplatin + Gemzar produced limited benefits. From January to April 2015, Carboplatin + Gemzar regime managed to stabalized the CEA level ranging from 22 to 30. CA19.9 stabalized from 31 to 70 during the same period. Table 5: CEA and CA19.9 on the march — treatment failed! Error in platelet reading? In April CEA was around 29 to 31 while CA 19.9 was around 37 to 45.But barely 2 months after the completion of chemotherapy, the CEA shot up to 93.2 and CA19.9 went up to 511. Jack said he was disappointed with the results, in spite of the initial good response to chemotherapy. He decided to “shop” for alternative medicine while waiting for his doctor to take the next step. This is indeed a sad case but not a unique one. Over the years we have seen cases after cases like this. After the chemo, the tumour markers dropped or the tumour shrunk or disappeared. But such responses did not last long. After a few months, the cancer recurred and this time it became more aggressive. We sat down with Jack and tried to understand what was going on. No doubt about it, he was very much encouraged with the initial results. Within 8 months of treatment his CA 19.9 which was at 9,524 dropped to less than 2.0. That was a great achievement indeed. Who would not be excited about such feat? But what many patients don’t know or what those who should know do not want to know is that such dramatic drop of CA 19.9 (or even total shrinkage of tumour) is not permanent. It NEVER translates into a cure. It is meaningful in the short term but meaningless in the long term. Do you see any truth is that statement? Many of us may want to ask: Where is the problem? What causes this problem? What can we do about it? Jack told us that his oncologist is a very nice man and he was trying his best to cure him. Understandable. We cannot blame the doctor. Legally and medically, apart from chemo or oral drugs, he has nothing else to offer you. He can’t ask you to take supplements or herbs, etc. Unfortunately, some oncologists will rip apart those who dare to suggest that patients take herbs, vitamins or control their diet. Nonsense they say — all these non-medical ways are not scientifically proven. But hang on, is the present day treatment like above based on “real science”? Granted, these chemo-drugs have undergone clinical trials and have been approved by Government Authorities. But, what does all this mean? 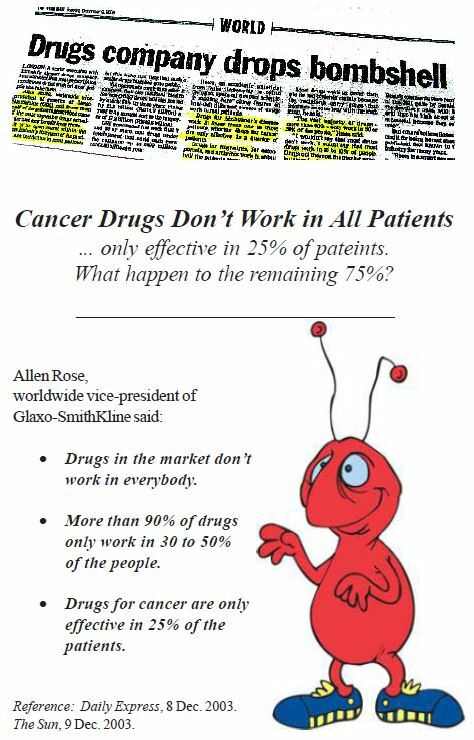 The approved drugs can cure your cancer? Far from it! 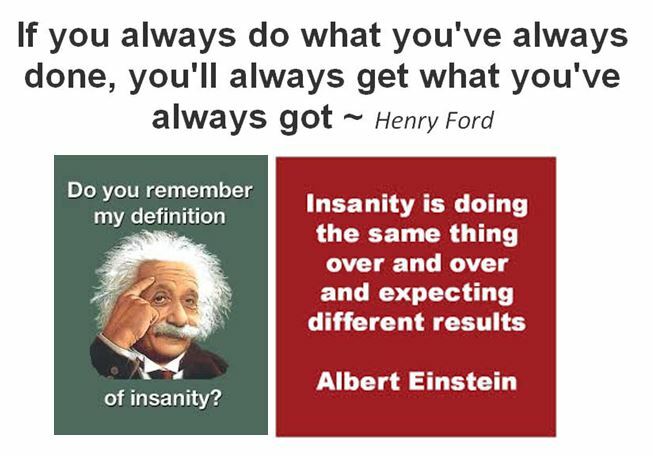 Ask, why do we see failures after failures being repeated over and over again? It appears that failures seems to be the norm rather than an exception. I have one suggestion for those who want to do something! Think about it seriously. Granted, chemo-drugs sometimes can make the tumour markers drop to normal level or the tumour shrunk completely after the treatment. But what do you do after this achievement? 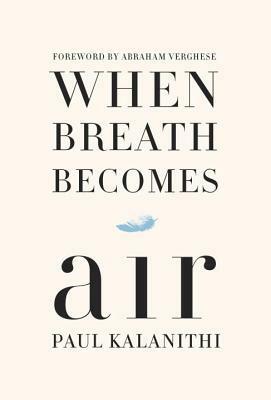 Send the patient home and ask him to live the same style of life that he/she had before — the earlier life that promoted his/her cancer? What if we have a program that teaches patients how to live a healthy life after being effectively treated? What if we teach them to change their life style and diet? What if we ask them to take supplements, vitamins or herbs to make them healthy? What if we ask them to take time to exercise? These are things that patients can do for themselves when they go home after their “apparently successful” medical treatment. Above all, these are “harmless” efforts that can result in a better and healthier cancer-free life. 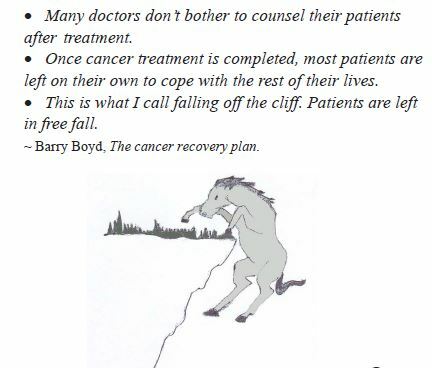 In short, why can’t the medical establishment work together with the alternative healers to try and help patients prevent or minimize their cancer recurrence? At CA Care we teach patients all the above. We take over after patients decide not to go for any more medical treatments. And often for those who are really committed, we succeeded in helping patients to heal themselves.